Friday morning at DEMA Show 2014, the second most-crowded room in the building was N236. It was standing room only at the Blue The Dive seminar with well over a hundred people jostling for space in the small conference hall. We had come together to listen to what the folks at bluethedive.org wanted to say to us about ocean conservation. Turns out, they were more interested in what we had to say. We did get to hear about the history and the mission statement of the organization, but within half an hour they turned the classic lecture-style seminar on its head and were splitting us into groups based on our individual areas of expertise within the dive community and asking us to brainstorm about ways to help the ocean. This straight-to-the-point approach is emblematic of their whole philosophy, because what they’re calling for is nothing short of a paradigm shift. 1. Improve dive industry sustainability and conservation practices. 2. Create a more informed and educated consumer to improve the way our communities interact with the ocean. 3. Improve dive industry manufacturing and supply chain sustainability business practices to reduce waste and increase efficiencies and profits. 4. Support scientific research and actions that protect our ocean resources. The difference is that instead of just talking about these problems, lamenting the decline of the environment that we all depend on to support our passion, livelihoods, and continued existence, Blue The Dive wants us to get away from the idea that the obstacles are insurmountable, or that this is someone else’s problem to fix. In fact, they want us regard Blue The Dive as our own. We at DeeperBlue.com had a chance to speak with one of the Core Leadership Team last night, Mehgan Heaney-Grier, a former U.S. champion freediver and Program Coordinator for the Ocean Ambassador Certification Program with the Colorado Ocean Coalition, to get a more in-depth look at Blue The Dive‘s mission. The one thing she stressed was that Blue The Dive belongs to all of us. As divers, no one has a closer view of how the ocean is changing. Who among us hasn’t picked up litter from the bottom of the sea, seen a marine animal dragging a hook and length of line, or noticed a change in the conditions of the ocean from when we first started diving? As Dr. Mikki McComb-Kobza, another member of the Core Leadership Team puts it, “We are the sentinels. We are the canaries in the coal mine.” Since we have such a closeup view of what is changing and what is at stake, there can be no better ambassadors for bringing the urgency of the problem to the 96 percent of the world that doesn’t dive. And that’s it, exactly. We can’t just sit there. While we avoid the subject, or vow to think about it another day, the oceans and everything that lives in them or depends on them for survival are suffering. Blue The Dive insists that we acknowledge the elephant in the room, but even more importantly, that we realize that the elephant belongs to us. It is absolutely our problem, and there is no better time to start solving it. I asked Mehgan what she would say to those who believe that their individual efforts are not enough, that the problems are so profound that working to fix them is an exercise in futility. She said, “People are already doing big things.” It doesn’t matter whether you’re a single diver or the owner of a dive shop, and obviously one may have the ability to mobilize bigger changes than another, but the important part is to focus on solution-based thinking and to actually do the change. The strength is in the collective, the power of the group. Graham Casden is another member of the Core Leadership Team (there are 15), and he shared an anecdote about his own company that demonstrated just how these small changes can accrete into a meaningful shift. He happened to notice that the manufacturer he was ordering snorkels from shipped them all in individual (and unrecyclable) plastic bags, creating a lot of unnecessary waste. So he made a phone call, and then another. Within six months, he was receiving the snorkels sans bags, reducing the amount of waste on Graham‘s end, and saving the manufacturer a bundle in packing materials on theirs. The breakout groups at the meeting were organized around this same idea — identifying ways within each of our specific areas of expertise to create change and sustainability. Whether it be media, training, dive shop owners, or individuals, we all belong and we all have something valuable to contribute. The meeting was more than just talk, though. Blue The Dive came armed with two immediately-actionable initiatives. The first, their Early Adopter Program, invited six dive shops to sign up for Blue The Dive‘s program for identifying and promoting best practices in the industry. With coaching from the organization, these shops will have the opportunity to rework their day-to-day operations to include more sustainable habits, and eventually earn an eco-certification from Blue The Dive. Participants in the Early Adopter Program will save big on the cost of the training and certification as an incentive for leading the way. Mehgan shared that not only was Blue The Dive able to fill those six slots, they have a list of other shops that want to be next in line. The support is out there, we just have to identify and activate it. The second part of their strategy for change is The Pledge. Essentially, it is a commitment to do what you can, however you can to promote sustainability and work toward a bigger change. This one’s a no-brainer. In fact, stop reading for a minute and go over and sign it yourself. Then tell your friends. We’ll wait. As we were talking with Mehgan about Blue The Dive‘s goals, she began to talk about the future of the industry, identifying two key things she feels are moving into ascendence — the environment, which is the issue bringing us together, but also youth involvement. She envisions a dive industry where those things are built into the business model itself, confident that sustainability and the bottom line are not mutually exclusive goals. Recognizing that most of the kids of the coming generation are already familiar with conservation and sustainability efforts (unlike many of the old guard who were raised to believe that the earth was inexhaustible and invincible), Mehgan sees them as the best hope for future success. A paradigm shift is one of the most challenging social undertakings out there, but it’s much easier to start with kids who haven’t had the chance to get too set in their ways and who have enough innocence to still believe in the impossible. It is that kind of energy and conviction that we need to cultivate, and putting our efforts into teaching responsible stewardship to those who will inherit the world from us is the best way to ensure that they will have a world left to pass on to those who come after them. Though they have separate names and touch different shores, all of the world’s oceans are really just one continuous body of water, and they cover more than two-thirds of the Earth’s surface. We depend on them, and they belong to us all. By inviting us to share in the organization, Blue The Dive is volunteering to be that grain of sand in the oyster, agitating the status quo and providing the heart around which we can all gather to form something huge — and beautiful — in the name of our beloved oceans. 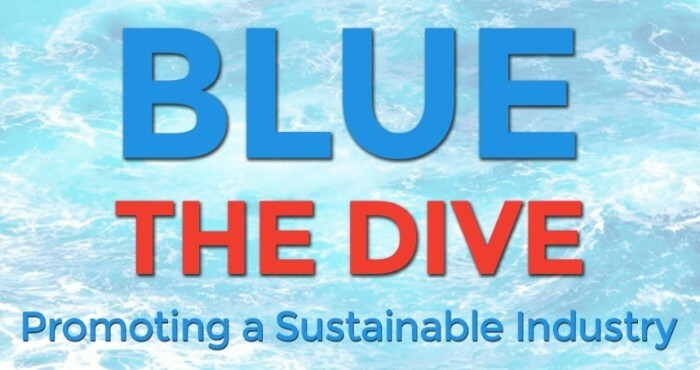 Blue is the new green, so get over to Blue The Dive and take ownership, make changes. From heavy-hitting CEOs to humble reporters, we all have something to offer, and there has never been more at stake. Learn more at bluethedive.org or follow them on Twitter at @bluethedive. I like that! But there´s so much more the Dive Industry can do! We should be using our leverage – that of generating billions of dollars and providing thousands of jobs – to be heard by policymakers and hogh-level government officials on the major environmental crises affecting our shared oceans, eg overfishing and climate change. Moving toeards sustainability IN the industry is great but we should be able to go the extra mile and mobilize further!